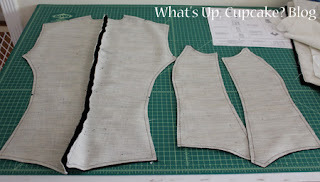 With all of the work that I did on my recent dress, I also snuck in time to work on my dance jacket. I cut out all of the pieces, finally tracked down hair canvas (it took 3 fabric stores to find), and assembled the lining fabric. 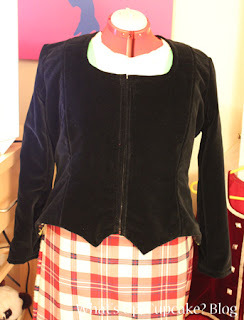 The velvet pieces with the hair canvas interfacing. Starting to assemble. One small challenge with this project is that I do have to account for the size of my kilt... which is about 8 yards of Scottish wool. It's heavy duty stuff and definitely adds a bit of space around the entire middle of the jacket. So I've bulked up Emmy with my kilt and have fitting everything around it. My mom came over this weekend to help me with inserting the zipper and boning. The front zipper has to be precise as the velvet has to meet perfectly in the middle to keep it completely hidden while closed. 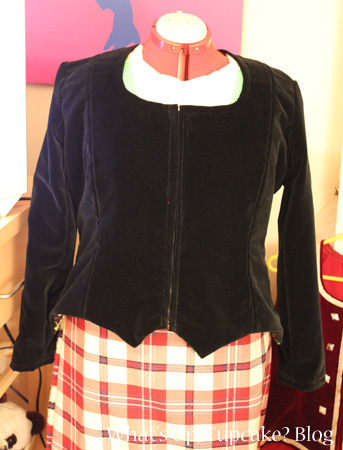 I'd never worked with boning before so my mom showed me how to create a small pocket along the edge of the zipper. 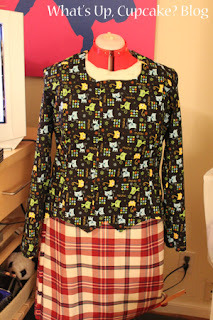 Once it was in stitched, I only had to slip the boning into place. I need to take it in around the middle and the lower hip area. I need to make some slight tweaks to the fit around the waist as it's a little loose and rises up too much when I raise my arms. Once that fit is done, it'll be a lot of hang stitching of the silver trim into place and inserting the buttons. wow, This is looking gorgeous already, well done you.